On the 26 & 27 of November, ENSIE staff participated in the 3rd EPAP Convention that was held in Brussels. On the first day, Davide Ziveri Italian representative of ENSIE shared his experience within the side-event 'In-work poverty - The Contribution of Employment to Poverty Reduction and Inclusion' co-organised by ENSIE, EAPN and ESADP. Key messages of the in-work poverty side-event - ENSIE, EAPN & ESADP. For more information about this good practice, visit the Social club page. For more information about on the side event 'In-work poverty - The Contribution of Employment to Poverty Reduction and Inclusion' , visit EAPN's page. For more information about the anual Convention, visit the European Commission's page. On the 5th, 6th and 7th of December, the 2nd Convention was held in Brussels. Charlotte Gruber presented a project from Bdv-Austria, called “Leo GmbH: Social Market for people with low income” during the speed dating session. Charlotte Gruber, ENSIE President comments: “... – the question is only: what of all the nice word will be put into reality?" The final report of the convention as well as the conclusions, results of the workshops, the list of the Speed dating projects and the video can be downloaded on the website of the European Commission. Meeting with Elena Loredana Puiu from the EC on the Public Procurement Directive proposition and presentation of ENSIE’s contribution. Meeting with Valérie Guigue-Koeppen of the EC DG Concurrence on the new Almunia package. Round table of the DG regional policy on the future regulations on structural funds. More info. In support of the "Youth on the Move" and "European platform against poverty" Flagship Initiatives, DG Research & Innovation of the European Commission organises on 17 - 18 November 2011 an evidence-based and policy-oriented conference on "Youth and Social Inclusion". At this occasion a policy review on "More opportunities, better access, and higher solidarity for youth on the margins of society" will be presented and discussed. Researchers, stakeholders and policy-makers will discuss the potential for inclusive educational and labour market policies, activated civil society, and last but not least, social intervention programmes carried out in cooperation and partnerships of public and private sectors supported by social protection measures, together with young people. Conference of the European Commission on the Social Business Initiative. More info. The Convention organized on 17-18 October in Cracow, analysed the progress made towards the headline target of reducing poverty and social exclusion by at least 20 million by 2020 and the implementation of the European Platform against Poverty. It has also tried to tackle suggestions for future actions. 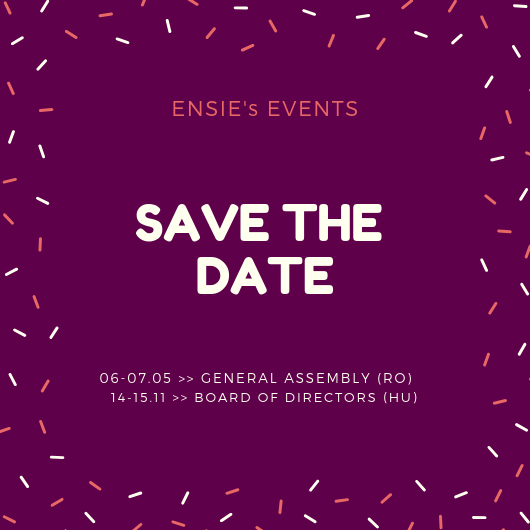 ENSIE participated in the convention through ENSIE's coordinator, Patrizia Bussi and the representative of the ENSIE’s Romanian member, Raluca Ouriaghli. The conclusions of the workshop and the impressions of Raluca Ouriaghli will be presented in the November’s newsletter. Modernising Public Procurement - Conference "Towards a more efficient European Procurement Market"
ENSIE participates in the stakeholder dialogue of the European platform against poverty and social inclusion. ENSIE meet Malte Arhelger for its contribution to the Green Programme for Social and Solidarity Economy. ENSIE meet Concetta Cultrera, its responsible from the EC DG Employment, Social Affairs and Inclusion about the PROGRESS Programme. ENSIE meet Emmanuel Vallens from the EC DG Internal Market for the development of the SIEs in the Social Business Initiative. Salvatore Vetro will participate at the conference “Shared Social responsibility: securing trust and sustainable social cohesion in a context of transition.”. More info. Salvatore Vetro will participate at the launch event of the Social Innovation Europe initiative. Meeting of the European Year and presentation of the Platform against Poverty. ENSIE participated in the organisation of an open session of the Forum « Building together a society for everyone – A circle against exclusion » on 19th-20th October, at the Halles de Schaerbeek, Brussels. The topic of the session was: Social Integration Enterprises – an innovative promotion of active inclusion of vulnerable groups, European Network of Social Integration Enterprises (ENSIE). This session presented and examined the role of social integration enterprises through examples of good practices from Austria, Belgium and Italy. You will find here the programme of the Forum and the press release of ENSIE'session. ENSIE maintained its dialogue with the civil servants of the General Directorates who are responsible for the topics linked to social economy and work integration. ENSIE used electronic post, verbal exchanges and concrete actions in cooperation with Social Economy Europe (SEE). regarding numerous fields of activity. enterprises can offer apart their mission of “giving a job”. ENSIE was invited by the Inclusion, Social Policy Aspects of Migration, Streamlining of Social Policies division of the DG EMPL to participate in a peer review seminar on the topic of "The social economy from the perspective of active inclusion. Employment opportunities for people far from the labour market", that is to take place in Brussels, Belgium on the 12th and 13th June 2008. Here you can find the agenda, ENSIE’s contribution and the final conclusions written by the expert, Roger Spear and the Belgian government.